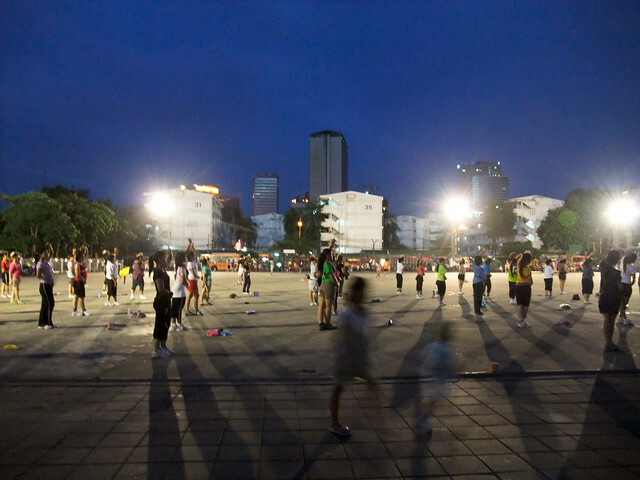 One of the things that you will see in many places around Bangkok in the evenings is public open-air aerobic dancing. Everybody can join in, and different instructors just show up each day and lead the group. At the end of the aerobic session, everyone can throw in some small money – usually 10 baht or 20 baht, which will be the payment of the aerobics instructor. This picture was taken in the Lumphini park in Bangkok. There are several reasons why these public aerobic classes are so popular. One reason simply is that it’s very noncommittal and open. You can join in whenever you like, but you never have to, you don’t have to sign up for anything, and everything is completely voluntary. So the first hurdle has been removed just by this kind of system. But the more important reason probably is in the nature of the Thai character. They are people who love to have a good time, they like to do things together with other people, and they enjoy dancing. This is perfect, because it combines both having fun with taking care of their health and feeling good. The people who participate here are both young and old, men and women. If you are on a Bangkok sightseeing trip and you feel like joining an aerobics class, just head to the nearest public park in the evening and wait for the whole thing to start. It’s most fun if you come with friends though.